Figure 21-1. Coronal section through the inidthalamus at the level of the mamillary bodies. The basal ganglia arc all prominent at this level and include the striatum and lentiform nucleus. The subthalamic nucleus and substantia nigra are important components of the striatal motor system. CM = centromedian nucleus; V.A = ventral anterior nucleus; VL = ventral lateral nucleus. 1. The striatum consists of the caudate nucleus and putamen. 2. The lentiform nucleus consists of the globus pallidus and putamen. 3. The corpus striatum consists of the lentiform nucleus and caudate nucleus. 4. 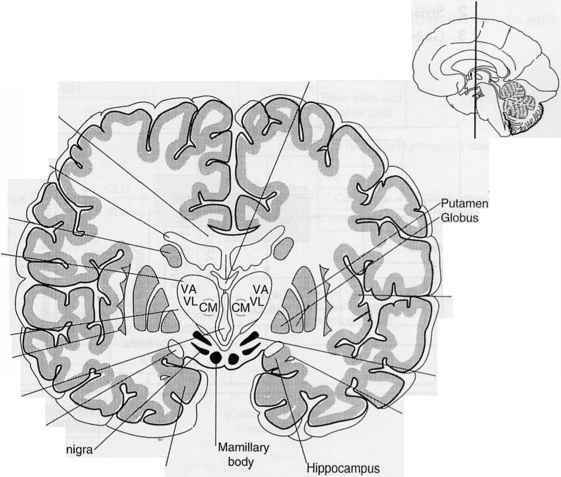 The claustrum lies between the lentiform nucleus and the insular cortex. It has reciprocal connections between the sensory cortices (i.e., visual cortex). II. THE STRIATAL (EXTRAPYRAMIDAL) MOTOR SYSTEM (see Figure 21-1) plays a role in the initiation and execution of somatic motor activity, especially willed movement. It is also involved in automatic stereotyped postural and reflex motor activity (e.g., normal subjects swing their arms when they walk). Figure 21-2. Major afferent and efferent connections of the striatal system. 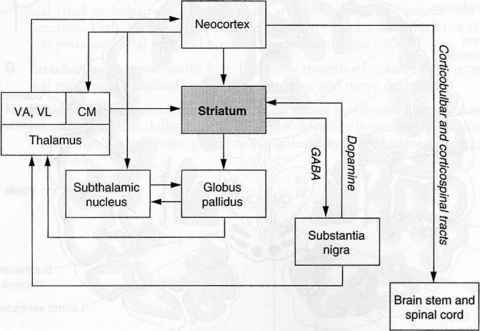 The striatum receives major input from three sources: the thalamus, neocortex, and substantia nigra. The striatum projects to the globus pallidus and substantia nigra. The globus pallidus is the effector nucleus of the striatal system; it projects to the thalamus and subthalamic nucleus. The substantia nigra also projects to the thalamus. The striatal motor system is expressed through the corticobulbar and corticospinal tracts. CM = centromedian nucleus; GABA = 7-aminobutyric acid; VA = ventral anterior nucleus; VL = ventral lateral nucleus. B. Figure 21 -2 shows the major afferent and efferent connections of the striatal system. A. Parkinson's disease is a degenerative disease that affects the substantia nigra and its projections to the striatum. 1. Results. Parkinson's disease causes a depletion of dopamine in the substantia nigra and striatum as well as a loss of melanin-containing dopaminergic neurons in the substantia nigra. 2. Clinical signs are bradykinesia, stooped posture, shuffling gait, cogwheel rigidity, pill-rolling tremor, and masked facies. Lewy bodies are found in the melanin-containing neurons of the substantia nigra. 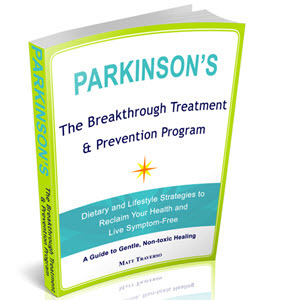 Progressive supranuclear palsy is associated with Parkinson disease. 3. Treatment has been successful with L-Dopa. Surgical intervention includes pallidotomy (rigidity) and ventral thalomotomy (tremor). Figure 21-3. Major neurotransmitters of the striatal motor system. 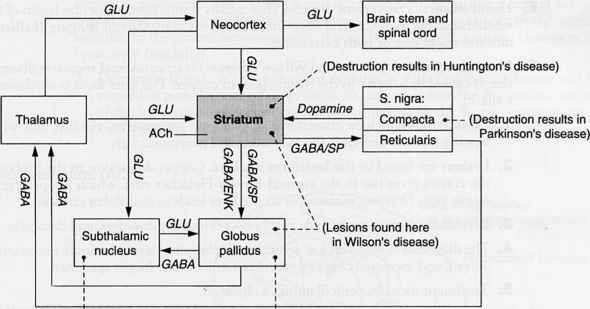 Within the striatum, globus pallidas, and pars reticularis of the substantia nigra (S. nigra), 7-aminobutyric acid (GA/3A) is the predominant neurotransmitter. GABA may coexist in the same neuron with enkephalin (ENK) or substance P (ST). Dopamine-containing neurons are found in the pars compacta of the substantia nigra. Acetylcholine (ACh) is found in the local circuit neurons of the striatum. The subthalamic nucleus projects excitatory glutaminergic fibers to the globus pallidas. GLU = glutamate. B. Methylphenyltetrahydropyridine (MPTP)-induced parkinsonism. MPTP is an analog of meperidine (Demerol). It destroys dopaminergic neurons in the substantia nigra. C. Huntington's disease (chorea) is an inherited autosomal dominant movement dis-order that is traced to a single gene defect on chromosome 4. 1. It is associated with degeneration of the cholinergic and Y-aminobutyric acid (GABA)-ergic neurons of the striatum. It is accompanied by gyral atrophy in the frontal and temporal lobes. 2. Glutamate excitotoxicity. GLU is released in the striatum and binds to its receptors on striatal neurons resulting in an action potental. GLU is removed from the extracellular space by astrocytes. In Huntington's disease GLU is bound to the N-methyl-D-aspartate (NMDA) receptor resulting in an influx of calcium ions and subsequent cell death. This cascade of events with neuronal death most likely occurs in cerebrovascular accidents (e.g., stroke). 3. 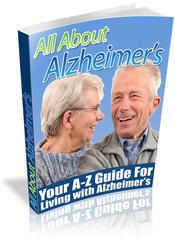 Clinical signs include choreiform movements, hypotonia, and progressive dementia. 1. Sydenham's chorea (St. Vitus' dance) is the most common cause of chorea overall. It occurs primarily in girls, typically after a bout of rheumatic fever. 2. Chorea gravidarum usually occurs during the second trimester of pregnancy. Many patients have a history of Sydenham's chorea. E. Hemiballism is a movement disorder that usually results from a vascular lesion of the subthalamic nucleus. Clinical signs include violent contralateral flinging (ballistic) movements of one or both extremities. F. Hepatolenticular degeneration (Wilson's disease) is an autosomal recessive disorder that is caused by a defect in the metabolism of copper. The gene locus is on chromosome 13. 1. Clinical signs include choreiform or athetotic movements, rigidity, and wing-beating tremor. Tremor is the most common neurologic sign. 2. Lesions are found in the lentiform nucleus. Copper deposition in the limbus of the cornea gives rise to the corneal Kayser-Fleischer ring, which is a pathognomonic sign. Deposition of copper in the liver leads to multilobar cirrhosis. 3. Psychiatric symptoms include psychosis, personality disorders, and dementia. 4. The diagnosis is based on low serum ceruloplasmin, elevated urinary excretion of copper, and increased copper concentration in a liver biopsy specimen. 5. Treatment includes penicillamine, a chelator. G. Tardive dyskinesia is a syndrome of repetitive choreic movement that affect the face and trunk. It results from treatment with phenothiazines, butyrophenones, or me to-clopramide.